Farmer of the Yeartells the story of an aging farmer who, after selling the farm he's worked for over 60 years, finds himself useless and adrift. Struggling to maintain his youth, he road-trips across the country in a ’73 Winnebago with his equally directionless and unreasonably self-confident granddaughter. Heading west, they find themselves in seemingly impossible situations with only each other for support. As the journey progresses, so does their relationship and they begin to understand and appreciate each other as individuals while discovering that being young and being old, aren’t all that different. 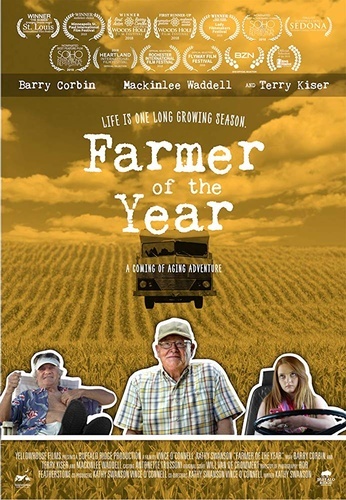 Filled with typical, understated Midwestern humor and restraint, 'Farmer of the Year' captures the sense of real life, location and spirit of the rural Midwest with a unique combination of homegrown and Hollywood. The film delicately blends the comedy and drama of life. References to the Vikings, mosquitoes, fishing and Grainbelt...it's all in there.